Find out what's happening when. What is the timescale for Reval2020? April 2018: LPS sent letters and Rent and Lease Questionnaires (RALQs) to the occupiers of all relevant non-domestic properties across Northern Ireland, requesting current lease and rent details. June 2018: LPS will send reminders to all occupiers of all relevant non-domestic properties who have failed to make any return. The rental information you supply will be analysed and reviewed to produce new rateable values in the new Valuation List. 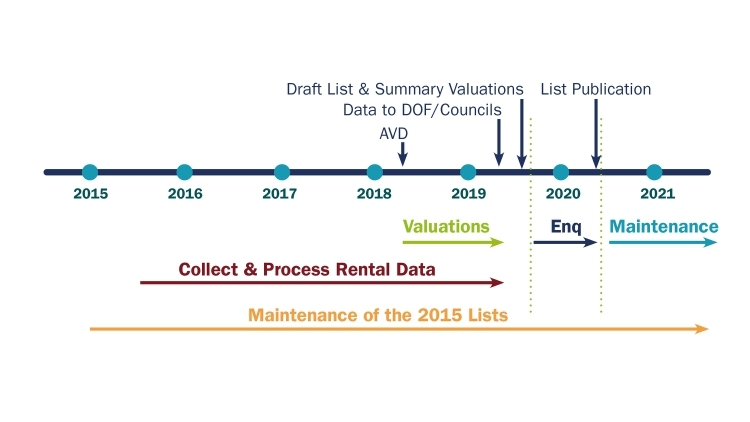 Autumn 2019: LPS will publish a draft schedule of values online where you will be able to check your valuation and compare it with similar property types. April 2020: Rate bills based on the new rateable values will issue.